Each time Eric Maupin looks out over a green field, sees his wife, Jo Ann, coming down the road bringing lunch in the field or recalls that one of his toddler Cara's first words was 'tractor,' his decision to return to farming is reinforced. Each time Eric Maupin (‘97) looks out over a green field, sees his wife, Jo Ann, (‘04) coming down the road bringing lunch in the field or recalls that one of his toddler Cara's first words was 'tractor,' his decision to return to farming is reinforced. The truth is, in spirit, he never really left. Eric's career plans were to get an agriculture business degree at UT Martin and finish up with an agriculture law degree at UT Knoxville. At the time, he was not sure the opportunity to return to the family farm would present itself, “but I still had that desire ... to help farmers.” As it turned out, he got involved at UT Martin, completed an agriculture internship abroad and added a communications minor. After he graduated, Maupin was appointed as the Tennessee Department of Agriculture's first international agricultural marketing coordinator. “My job, specifically, was to help agricultural companies ... that felt like they could move their product to an international market,” said Eric. Focusing on smaller companies throughout the state, he guided them through every facet, from marketing and product regulations to logistics. “I thoroughly enjoyed my job; loved the people I worked with. I stayed overseas a lot ... months at a time,” he said. But then, Eric's father, Larry, decided he wanted to semi-retire after 35 years of farming in Dyer County. And the land Larry was farming was not just any piece of ground. Eric's great-grandfather bought the land in 1938. His great-grandfather was later joined in farming by his son, Calvin, Eric's grandfather, who was then joined by his son, Larry. The Maupin family, he said, had everything from chickens, cattle and a farrow-to-finish hog operation to row crops. Now, Eric and Jo Ann grow corn, soybeans and wheat as main crops on more than 2,000 acres of land they own and rent. They have commercial beef cattle and produce all the needed hay. They also have a seed sales business and are partners in a livestock truck-wash business. Jo Ann, who grew up on a dairy farm, provides the bookkeeping services for all the family businesses. They have one full-time employee, Andy Butler, and Eric hires seasonal employees when needed. Eric's mother, Joan, has continued to help. As an aside, Eric, a licensed auctioneer, calls bids for a local auction and realty company and an auction barn in the off-season. 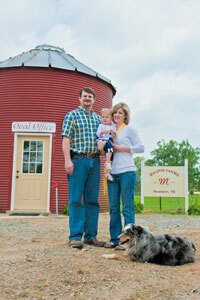 In 2009, Eric and Jo Ann were named Tennessee Farm Bureau Tennessee Young Farmers of the Year, advancing to the national competition, where they were runners-up. 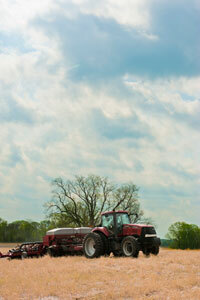 They won use of a tractor for a year, as well as other equipment and prizes in the contests. Eric speaks confidently about the many ways technology has changed and improved farming in preparing to meet the consumers' demands in the future. “In the next 40 years, it is predicted the American farmer will have to produce the same amount of food that has been produced since the conception of farming,” he said. 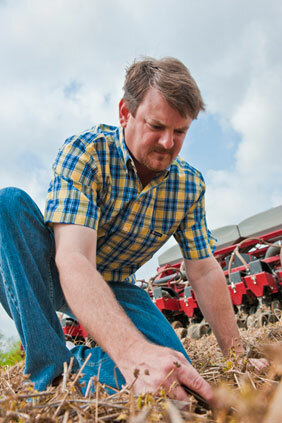 He also talks passionately about his and other farmers' commitment to being good stewards of the environment. “One of the most important things we can do as agriculturists is preserve the land for the next generation,” he said.